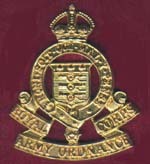 Dad was called up just after his 20th birthday and on 6th March 1941 joined the Royal Army Ordnance Corps. After initial training he was posted to North Africa where his job was to keep the troops equipped with ammunition and other explosives at Turbruq (Tobruk), Mersa Matruh, Sidi Barrani and El Alamein (and elsewhere?) and was promoted in the field to Lance Corporal before being one of 35,000 abandoned troops subsequently captured by Rommel's Afrika Korps at Tobruk on 20/21 June 1942 following Lt General Ritchie's retreat to the Egyptian border from defence of the ineffectual Gazala 'Line'.